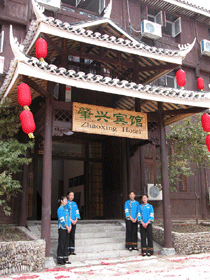 Zhaoxing is one of the most interesting villages in Guizhou. They only get about 700 visitors per year but that will be changing quickly with the addition of an airport nearby. It is a slightly bumpy ride on the road to get there but definitely worth it. Zhaoxing still has its traditional wooden structures including a number of "Wind and Rain Bridges" as well as a total of five drum towers.